There are a various funding options available from different levels of government and private organizations. They are available to families with children with special needs ranging from developmental support needs to physical/mobility needs. The general purpose of a program that provides funding is to compensate or financially assist families for expenses, services, or devices related to their child’s disability, and to give families a tax break. Note: Some of the following funding options are based on a family’s income. Consider applying for all funding options regardless of your income as many of these applications take several months to process and your family’s financial situation may change by the time your applications are officially reviewed. Revenue Canada offers the Disability Tax Credit for individuals with disabilities. The disability amount is a non-refundable tax credit used to reduce income tax payable on your return. This amount includes a supplement for persons under 18 at the end of the year. If a child under 18 is eligible for the disability amount, that child is also eligible for the Child Disability Benefit, an amount available under the Canada Child Tax Benefit. See below for more details. § The individual must dedicate a certain amount of time specifically for life-sustaining therapy, but does not include implanted devices or special programs of diet, exercise, hygiene, or medication. Begin by completing the Disability Tax Credit Form T2201. The form can be obtained through your local Tax Services Office or at the Canada Customs and Revenue website. Keep in mind that Part B of the form needs to be filled out by a medical practitioner. This section allows the medical practitioner to provide details about the person’s disability. Revenue web site: www.cra-arc.gc.ca You can also call 1-800-959-2221 for information and/or applications. Families who are eligible for Canada Child Tax Benefit for a child will receive the CDB only if the child also qualifies for the Disability Tax Credit. Not all children with disabilities will qualify for this benefit. Only children with severe and prolonged disabilities. See the Disability Tax Credit Certificate info sheet to review the eligibility criteria. Begin by completing the Form T2201, the Disability Tax Credit Certificate. You must get this form completed and signed by a qualified practitioner (e.g., medical doctor, speech and language pathologist). Send the completed and signed form to your tax centre. The Canada Revenue Agency (CRA) will determine whether or not you are eligible to receive the child disability benefit. The CRA processes the forms throughout the year, so you do not have to wait until it’s time to file your tax return to submit your form. You must also apply for the Canada Child Tax Benefit, if you have not done so already. The RDSP is a long-term savings plan to help Canadians with disabilities and their families save for the future. The "beneficiary” of the RDSP is the person who will receive the money in the future. To help you save, the Government pays a matching grant of up to $3,500, depending on the amount contributed and your family income. The Government also pays a bond of up to $1,000 a year into the RDSPs of low-income and modest-income Canadians. long-term disability and are under age 60, a Canadian resident with a Social Insurance Number (SIN), eligible for the Disability Tax Credit (Disability Amount) and looking for a long-term savings plan. Apply through financial organizations (banks) that offer the Registered Disability Savings Plan (RDSP), grant and bond. The Canada Child Tax Benefit (CCTB) is a tax-free monthly payment made to eligible families to help them with the cost of raising children under age 18. The CCTB may include the Child Disability Benefit (CDB), a monthly benefit providing financial assistance for qualified families caring for children with severe and prolonged mental or physical impairments. Also included with the CCTB is the National Child Benefit Supplement (NCBS), a monthly benefit for low-income families with children. The NCBS is the Government of Canada’s contribution to the National Child Benefit, a joint initiative of federal, provincial, and territorial governments, and First Nations. § you or your spouse or common-law partner must be a Canadian citizen, a permanent resident, a protected person, or a temporary resident who has lived in Canada for the previous 18 months. Contact your local Tax Services Office or visit the Canada Customs and Revenue web site: www.cra-arc.gc.ca You can also call 1-800-959-2221 for information and/or applications. The Universal Child Care Benefit helps families balance work and family by supporting their child care choices through financial assistance. This benefit of $100 a month — up to $1,200 a year per child — is paid to parents for all children under six years of age. Payments are made directly to parents so that they can choose the child care that is best for their children and their family’s needs. The Universal Child Care Benefit is in addition to existing federal programs, such as the Canada Child Tax Benefit, the National Child Benefit Supplement and the Child Care Expense Deduction. This new benefit does not affect the benefits families receive under these programs. The only exception is that the Canada Child Tax Benefit supplement, a small monthly amount previously received by some families, has been rolled into or combined with the new Universal Child Care Benefit. All Canadian families with children under six are eligible, regardless of income or the type of child care they choose. This benefit is taxable in the hands of the lower-income spouse. ACSD provides help to parents to assist with some of the extra costs of caring for a child who has a disability. In order to qualify for this program, financial and medical criteria must be met. Financial assistance ranges from $ 25 to $430 per month depending on the family’s gross annual income and the number of other children in the family. A child is also eligible for a dental card (basic dental coverage), and a drug card for prescription drugs. In addition, the program may help parents with extraordinary costs related to a child’s condition (e.g., travel to doctors and hospitals, special shoes and clothing, parental relief, wheelchair repairs, hearing aid batteries, and financial assistance for basic dental care, drugs, eyeglasses and hearing aids). Child must be under 18 years of age and live at home with a parent or a legal guardian. The income of a family will be evaluated to determine qualification. The child must have a severe disability that results in a functional loss. Extraordinary costs must be present which are incurred directly as a result of a disability. Obtain an application form from the nearest Ministry of Children and Youth Services (MCYS) Regional Office. A Special Agreements Officer (SAO) will review your application and contact you if further information is required. If this is the family’s first time applying, a SAO will make a home visit to meet the child and family and review the information on the application. The Special Services at Home (SSAH) program helps children with developmental or physical disabilities and adults with a developmental disability to live at home with their families by providing funding on a time-limited basis to address individual needs. With this funding, families can purchase supports and services, which they could not normally provide themselves and are not available elsewhere in the community. Each family has a unique set of circumstances. You will need to describe your family’s needs, establish your own goals and indicate the type of assistance you need. § if not living at home with their family, are not being helped by other residential services funded by the ministry. § three years have passed since you last applied. If you are approved for funding, you may use a streamlined application to apply for the program in the following two years. Download the Special Services at Home application form at www.mcss.gov.on.ca You will also need a medical statement or psychological assessment clearly confirming the diagnosis of your child’s disability. It is important that this document indicates the nature of the disability and supports your request for service. This statement can be attached to your application, or it can be sent directly to the Ministry of Children and Youth Services by the professional providing the medical statement or assessment. The Assistive Devices Program is administered by the Operational Support Branch of the Ontario Ministry of Health and Long-Term Care. The objective of ADP is to financially assist Ontario residents with long term physical disabilities to obtain basic, competitively priced, and personalized assistive devices appropriate for the individual’s needs and essential for independent living. Devices covered by the program are intended to give people increased independence and control over their lives. They may allow them to avoid costly institutional settings and remain in a community living arrangement. ADP covers 75% of the cost of some therapy equipment, up to a pre-set maximum. The remaining 25% is the responsibility of the family. Some additional resources may help provide assistance. (e.g. ACSD, Ontario Works, Easter Seals Society). When the family requires assistance to pay for this remaining 25%, or when ADP does not cover equipment, there may be additional resources that can provide assistance (e.g. ACSD, Ontario Works, Easter Seals Society). Any Ontario resident who has a valid Ontario Health Card and has had a physical disability for six months or longer is eligible. Equipment cannot be required exclusively for sports, work or school. Residents with a primary diagnosis of a learning or mental disability are excluded from ADP, as are those on Workers’ Compensation. There are specific eligibility criteria which apply to each device category. Initial access is often through a medical specialist or general practitioner who provides a diagnosis. Provides Equipment Funding for costs not covered by ADP, family resources and private insurance. Provides Incontinence Funding (i.e. diapers, catheters, and enema supplies) for children and youth with special needs aged 3-18, with irreversible incontinence or retention problems. Application form to be completed by your doctor Provides up to $3,000/year/client for equipment, meals, and accommodation. Parents are responsible for paying the first $50 depending on their financial situation. § Level B: $900 per year for children and youth aged 6-18 years using diapers or for those who use male external catheters. 2. Dental Conditions – Children who have identified dental conditions requiring emergency or essential care. parents may be asked to provide proof of financial hardship. 4. Ontario Residency – Children must be residents of Ontario and possess a valid Ontario Health Card number. Contact your local Public Health office to arrange a CINOT screening appointment to determine if the child qualifies or for more information. The child must be determined to be eligible for CINOT coverage and appropriate form signed BEFORE dental care is provided. Children First offers tuition assistance grants, so that parents who could not otherwise afford it can choose an independent elementary school. Children First grants are worth 50% of tuition, up to an annual maximum of $4,000. Applications may be submitted for children entering Junior Kindergarten to grade 8. Applicants must reside in Ontario. Please note that the assistance grants are based on household income. Please call the Charity office at (905) 852-1799 and ask for a Request for Assistance form. The form may be completed by the child's parent, physician, therapist, social worker, teacher or community liaison. Children with a physical or developmental disability under the age of 18. Please note that financial assistance based on household income. Access the application online at: http://t4gimages.com/lcl/article_images/PCCC_Application_EN.pdf You must provide a copy of a licensed medical practitioner’s diagnosis of your child’s disability. As part of the application you must provide two quotes (if available) from vendor/supplier on the cost of the item for which funds are being requested. Respite care is a family support service that provides temporary relief from the daily challenges involved in caring for a family member with an intellectual and/or physical disability. The benefits of respite care are numerous, but not always obvious. This service allows parents and primary caregivers time for themselves and can support and strengthen their ability to take care of their child. It can provide a break in the daily routine to help parents avoid burnout, stress and fatigue. Respite care also gives the child a change in her daily routine. It can provide the child with opportunities to build new relationships, move toward independence, participate in community activities, and make new friends. Respite is provided in many ways depending on the source (agency or individual), the needs of your family and available funds. Some respite programs send a caregiver to the family's home, while others require that the child come to a respite group home. At the same time, many parents choose to hire an individual to provide in-home respite care for their child. Respiteservices.com coordinates a network of agencies and organizations in Ontario, providing respite services to individuals with various disabilities, and their families. A respite access facilitator is available to help families identify their needs and locate the appropriate respite options. The CHAP (Community Helpers for Active Participation) Program is an integral part of Respiteservices.com and helps connect individuals with disabilities and CHAP workers. This is done through a Worker Database where the CHAP Program recruits workers interested in supporting persons with intellectual disabilities, including autism and/or a physical disability, to provide meaningful respite opportunities in the home or in the community. Families are able to access workers after joining the Family Registry. Visit the Respiteservices.com website for more information about respite services in your community - www.respiteservices.com. related to your child’s disability. It is a direct funding program based on your family income level. This program is for children under the age of eighteen (18) living at home with their family or legal guardian. You can apply by filling out an application on your own, or with the assistance of an agency or professional. This funding is designed to assist families caring for a member who has a disability requiring support beyond the care normally provided by a family. SSAH is most commonly used by families to contract a respite, or support worker to work with the special needs family member. Families who receive funding have the option of hiring a worker who can spend time with your child at home and/or help your child learn new skills. Respite care is a vital service for families. It helps to reduce stress and support the family members so that they can continue to care for their child at home. Respite support services have been developed to enhance the quality of life for children with developmental and/or physical disabilities while encouraging participation in the community. to see them. I felt so refreshed and ready to tackle anything. The children also loved it; they got to interact with other children, do arts and crafts, sing songs and make friends. I really recommend Respite Care; it really changed my life and gave me a better perspective on things. All parents at times need a break from their children. This is exactly what I needed. It made me be a better parent. HALIFAX—In a precedent-setting case that continued in Halifax on Monday, Maurina Beadle and Pictou Landing First Nation took the Government of Canada to court over its failure to provide Beadle’s son the same level of health care that a child living off-reserve would receive from the province of Nova Scotia. On the fourth anniversary of Prime Minister Stephen Harper's historic apology to First Nations people for the forced separation of children from their families under the residential school system, the Mi'kmaq mother was in court fighting for the health services that would allow her son Jeremy to remain at home under her care. "All the things that were promised in Harper's apology are things they are not doing for Jeremy," said Philippa Pictou, Health Director for Pictou Landing First Nation, sitting on a bench in courtroom 501 in the Law Courts on Lower Water Street in Halifax on Monday morning. "Kids being pushed into institutions, instead of being cared for at home." Jeremy Meawasige is a 17-year-old from Pictou Landing First Nation who was born with a complex array of disabilities and medical conditions. His mother, Maurina Beadle, had been providing all of his care without government assistance until a double stroke in May 2010 left her physically unable to meet his needs at home. 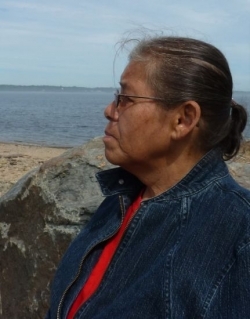 When, with help from the First Nation, Beadle applied for funding for home care health services, she found that her family's Aboriginal status caught her son in jurisdictional red tape that prevented him from receiving the same care on-reserve that he would be provided with by the province of Nova Scotia if he lived off-reserve. With the support of Pictou, Beadle is invoking Jordan’s Principle for the first time in its history. The child-first policy passed unanimously in the House of Commons in 2007. It dictates that in the instance of a jurisdictional dispute over which level of government foots the bill for a First Nations child in need of medical care, the government first contacted must come up with the funds; any arguments over who ultimately pays for the child's care are to be argued later. "Should a disabled First Nations child on-reserve be entitled to the level of care available to any child off-reserve?" asked Paul Champ, the lawyer representing Beadle and Pictou Landing First Nation, in his opening comments. Provincial governments generally provide continuing care health services in the home. But because First Nations fall under federal jurisdiction, provincial governments do not provide on-reserve health services. The federal government, either under Health Canada or Aboriginal Affairs and Northern Development Canada (AANDC, formerly INAC), is responsible for allocating to First Nation bands the resources to provide services "reasonably comparable to those provided by the province," Champ told the court on Monday. Bands must "administer program according to provincial legislation and standards." In her decision to deny Beadle the requested funding, AANDC official Barbara Robinson argued that Beadle and Pictou Landing First Nation were requesting services above and beyond the "normative standard of care in Nova Scotia." Champ argued that Robinson's interpretation of the normative standard of care in Nova Scotia is flawed. She determined that Jeremy Beadle is eligible to receive $2,200 per month, "full stop," explained Champ. $2,200 per month is the standard respite cap in Nova Scotia, according to a Community Services policy document. However, a support program available for persons with disabilities in Nova Scotia—one designed to "maintain the integrity of families," including enabling people with disabilities to live at home&mdashincludes a section in which "exceptional circumstances" allow for additional respite funding. These circumstances are defined in a number of points, and all apply to Jeremy. Upon cross-examination, Robinson conceded that the Beadles meet all exceptional circumstances criteria, but she also said that the "exceptional circumstances" part of the policy doesn't apply to Jeremy's case. Her reasoning, explained Champ, was that she relied on what happens "in practice," not necessarily in policy or law. According to the Social Assistance Act, the government "shall furnish assistance to all persons in need," and this includes home care. Cabinet can prescribe maximum levels of assistance. No maximum has been legally established; the $2,200 cap is, effectively, arbitrary. On Monday afternoon, the proceedings turned to Section 15 of the Charter of Rights and Freedoms, the equality guarantee that ensures that all people have access to equal benefit of the law. Champ reminded the court that the purpose of the Charter is to entrench the goal of equality, in particular to protect those who have been historically disadvantaged. "The disadvantage that First Nations have historically faced on reserves has never been resolved," said Champ. "Never. Never. First Nations people do not have equal access to schools, home care, or health." Robinson, when making her decision in the Beadle case, stated that the Charter doesn't apply. Champ explained the exception to the guarantee of equality that excludes First Nations people who, because of their unique status, are not entitled to the equal benefit of the law. First Nations people are the only legal group in Canada identified by race; they therefore fall into a "legal no-man's-land" because their situation can't be compared to anything--there is no comparative group with respect to which they can be discriminated. Therefore the Charter, and cases argued on the basis of discrimination, cannot be argued. Champ submitted that this is an improper way to interpret Section 15 of the Charter of Rights and Freedoms. The services provided by the federal government--either by Health Canada or by Aboriginal Affairs--to people on-reserve, are not provided by legal obligation, but as a matter of policy, based on agreements and programs negotiated with First Nations band councils. These services are policy, not law, Champ told the court. They are therefore discretionary, and provided according to the government official who interprets the policy. These agreements use such language as "Canada has elected to provide" a given service. These services are therefore a choice, provided at the discretion of the Government of Canada. One such policy is Jordan's Principle. As an "expression of the House," it is not legally binding, but the federal government is seeking to implement the principle across the country. Where there is no formal agreement, there are dialogues premised on Jordan's Principle, said Champ. He added that in any other case he would not make the argument that Jordan’s Principle legally applies. "But in this case, there are no statutes. We have policy manuals, funding agreements that change over time in content and funding levels essentially at the whim of the federal government. Do these policies have the form of law? Yes, because there is nothing else," said Champ. "This is, in a sense, is the best that we have." The animated purpose of Jordan's Principle, he said, is to acknowledge the fact that First Nations people are in a unique legal situation, and also to rectify the historical disadvantage of First Nations people. A breach of Jordan's Principle is evidence of discrimination, said Champ. "When a child is denied service for one day, as a result of a jurisdictional dispute, that is a breach of Jordan's Principle, and it is always a breach of Section 15 of the Charter." After the Crown’s submissions and the applicants' responses, Judge Mandimen acknowledged that the case is time-sensitive. Recognizing that the Pictou Landing First Nation cannot continue to provide funding for Beadle’s home care, Mandimen said that he would move his decision through as soon as possible. Beadle—and First Nations across the country who are watching this case—will still have to wait up to six months for a ruling, although after the trial Champ said he hopes for a ruling by the end of August. "I know this [case] won’t necessarily change things for Jeremy, by the time it’s over," said Beadle. "But this isn’t for Jeremy. This is for children across the country. They shouldn’t have to wait while the people in power procrastinate." A version of this article was originally published by the Halifax Media Co-op as a series, including an introductory article and blog posts about Monday’s morning and afternoon court proceedings. The last post of the series covering Monday’s court proceedings will be published by the Halifax Media Co-op later today.